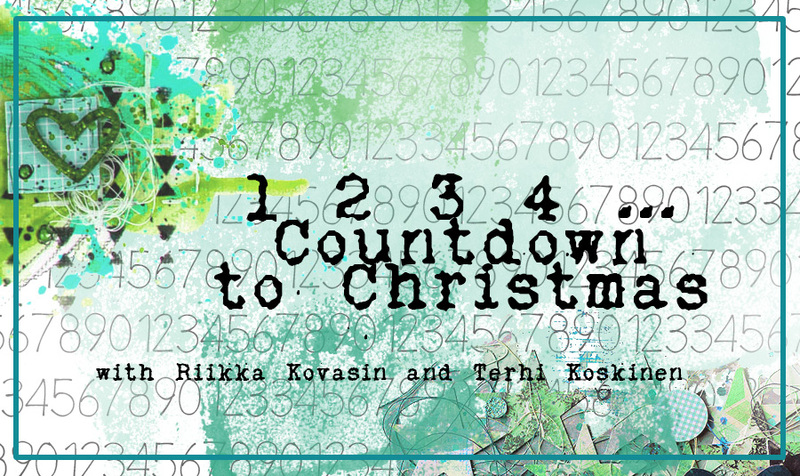 Welcome to the second Sunday of the Countdown to Christmas blog event! 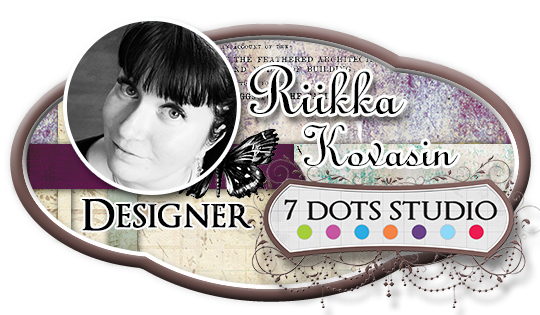 You can find my first post here (link) and Terhi's here (link). 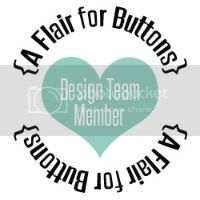 As Christmas and the Holiday season is all about giving and gatherings Terhi and me thought to arrange a blog event or a Christmas calendar to ease with the anticipation of the Holidays. We want to give you inspiration and ideas and most of all to thank you all for your visits and comments. And there's lovely giveaways in all our posts! 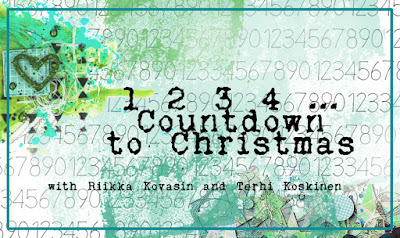 The event started on November 29th and there's a new "Countdown to Christmas" post in every Sunday on both of our blogs all the way to Christmas. So that's today, December 6th, and then 13th and 20th as well. There's also an extra post on Christmas Eve, like a gift under the tree. 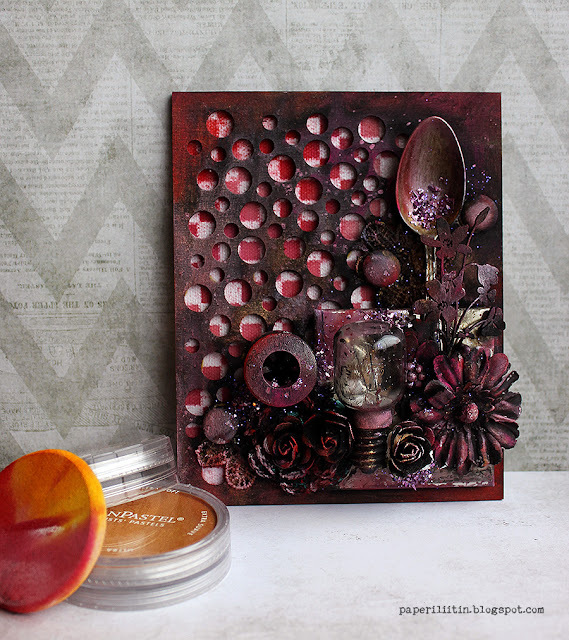 On our first post we were playing with chipboards and today we are using the lovely medium called PanPastels! Like I typed in the first post, every Sunday we have an inspirational video too. This time Terhi made an excellent video telling about PanPastels and showing a few basic techniques with them. 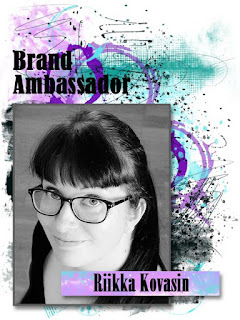 So hop ever to her blog to learn more! Here's the direct link to the post (link). I used the soft pastels to color my mini canvas. First I collaged different things on top of an old wooden stencil. There's an old spoon, flowers, pieces of lace and a lamp, for example. I painted most of the pieces black using black gesso but used clear gesso in few items as well. Then I added the colors to the piece by using two different colors of PanPastels, Permanent Red and Magenta. I also added the shimmering Pearl Medium White one. 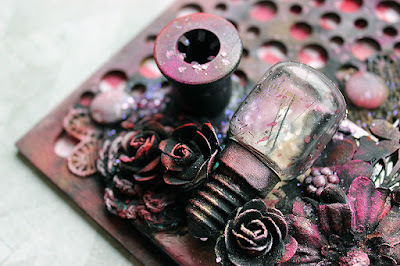 I used the same colors in the coloring of the resist canvas I then adhered to the back of the stencil. 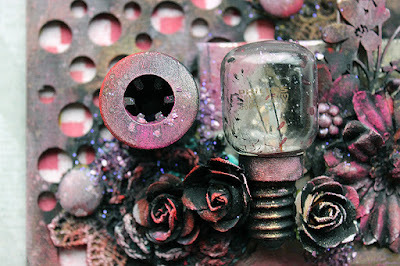 I finished the little decor piece with some flicks of mists and glitter. Now to the giveaway part! With the help of some generous sponsors we have a giveaway in each post and here's how it works. 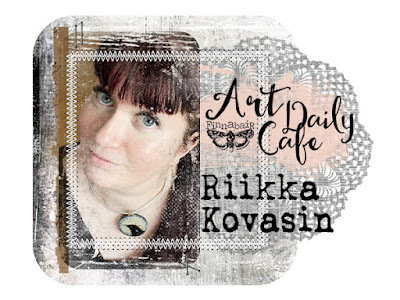 You have a possibility to have two tickets to each giveaway by leaving a comment to both of our posts - a comment here gives you one and comment on Terhi's blog gives you another. Each of our Sunday giveaways is open until 30th December 11.59 pm CET and the winners of these raffles are announced on both of our blog's on January 1st 2016. 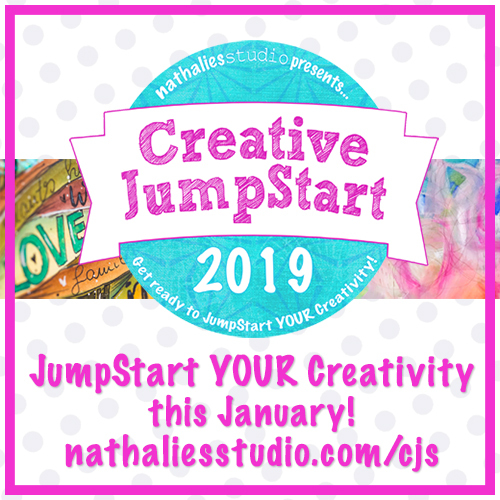 So be sure to stop by on the first day of the new year to see if you've won! 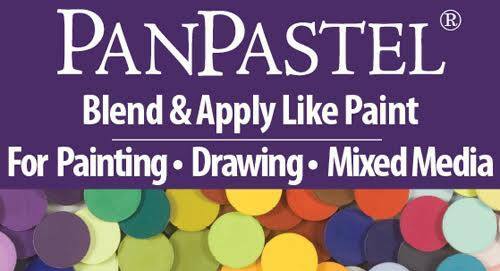 This time our sponsor is no other than PanPastel - Ultra Soft Artists’ Painting Pastels for Painting, Drawing & Mixed Media. 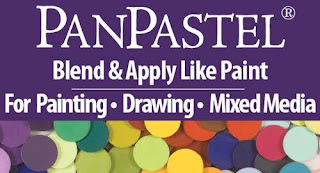 PanPastel Colors are professional artists’ quality soft pastel colors packed in a unique pan format (cake-like). The special qualities of PanPastel Colors mean that artists can blend and apply dry color like fluid paint for the first time. All PanPastel Colors are made using a unique manufacturing process requiring minimal binder and fillers, resulting in rich, ultra soft and super-blendable colors. PanPastels are easy to use, blend, layer and apply like paint. Please visit: www.panpastel.com to learn more about the medium! The price is a set of five PanPastel colors in a palette with some Soft Tool. 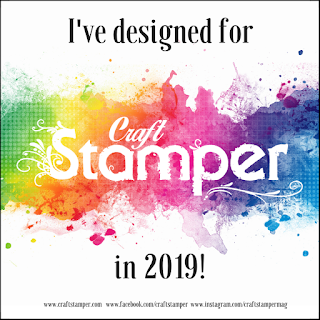 The best part is that the winner can choose the colors! 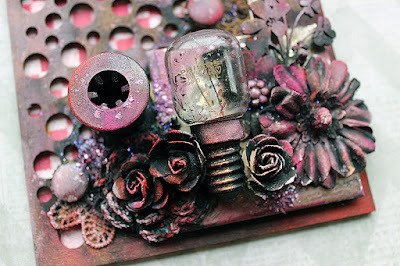 So leave a comment here and on Terhi's blog to be in for the giveaway. We wish you best of luck! Ohhhh, this is such a ymmy project. Love the depth of color. Upea. Näitä värejä en ole vielä kokeillut. Sun töitä on aina ilo katsella. 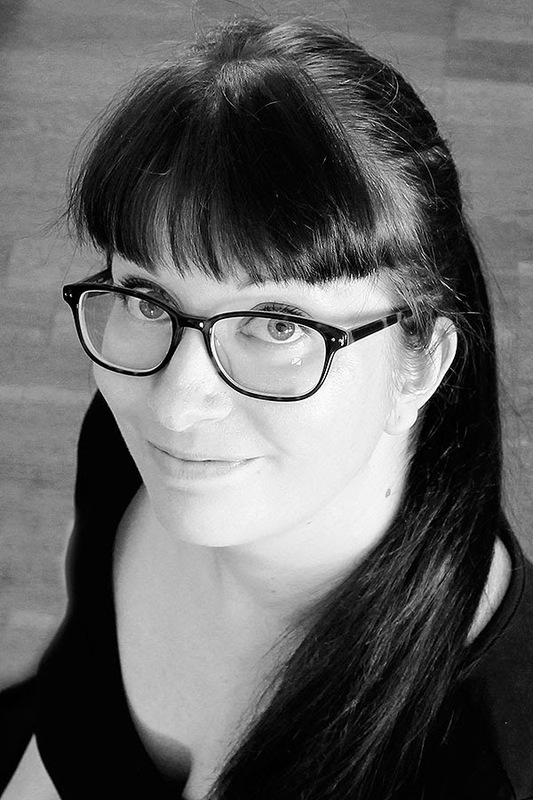 Niissä on aina hienoja yksityiskohtia, joita jään tuijotetaan pitkäksi aikaa. Panpastelleja en ole koskaan vielä kokeillut, suunnitelmissa on kyllä ollut mutta en ole vielä raskinut hommata, joten kiitos tästä mahdollisuudesta. Värit on tuolla laatikossa korkkaamatta. Mukavaa, että tulee vinkkejä kuinka näitä voi käyttää. Such a unique collection of items and success...it works beautifully! Love all the layers and colors. You always come up with the most beautiful and unique pieces! 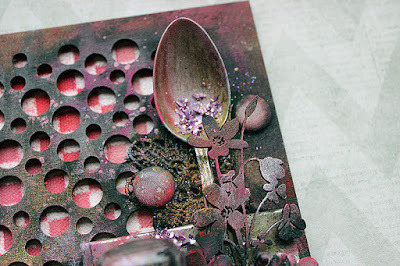 I love the piece behind all the elements and over the canvas (the wooden stencil I believe you mentioned) - it looks very cool - and the spoon has a mixture of the awesome colors! I love it! Thanks for sharing. Upea taulu ja mitkä värit, vau! Lovely canvas! I'd love to win some pan pasyels and give them a try. Ihan mielettömän upea työ.Tämä Pan pastellit haaveissa pitkään. 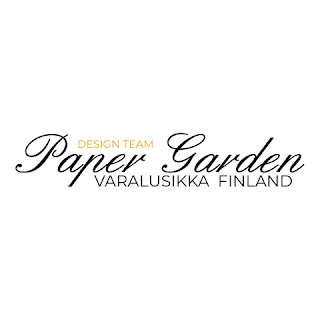 Pan pastellit tuli tutuksi eräällä kurssilla ja ihastuin heti niiden monipuolisuuteen ja pigmentin vahvuuteen. Kaapista muutama sävy löytyykin jo, mutta niiden käyttöön kaipaan selvästikin inspiraationlähteitä ja tukea. Mä niin tykkään sun rokimmasta lookista 😍 vaikka teillä on paljon samaa Terhin kanssa niin silti paljon niin eriä 😆 ja niin pitää ollakin! Great idea using an old wood piece for your base. The rich pantel colors remind me of cranberries. Love the detail from the holes in the wood stencil. Beautiful! I've never used PanPastels, but I can't wait to try! I love the countdown to Christmas and everything else you have shown us. Such creativity! Thanks for sharing. Wow! 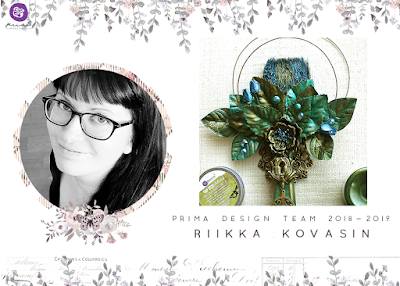 What an incredibly stunning creation Riikka! Love the colour scheme.